The Shelf List highlights a few of the most noteworthy (or just my favorite) items added to the catalog in the past month. Some of these are new acquisitions and some are items from our backlog. 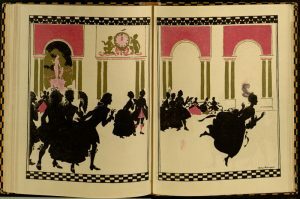 Selection of illustrations from Esther Borough Johnson’s scrapbook. Esther Borough Johnson (1866-1958) was an English artist and a few of her paintings are in the collections of British museums. This album displays her illustrations, mainly in graphite but with a few watercolors as well, of various European cities in the 1920s. Her husband, Ernest Borough Johnson, was an artist as well, and you can view a portrait he painted of his wife on the ArtUK website. Illustration by Arthur Rackham of Cinderella fleeing the ball at midnight. There are many, many illustrated versions of Cinderella, but this 1919 edition features striking silhouette illustrations by noted English illustrator Arthur Rackham (read a bio on Wikipedia). Selection of pages from the Edith Good scrapbook. Edith Good’s scrapbook showcases her watercolor illustrations, including portraits of family members, landscape scenes, and floral depictions. 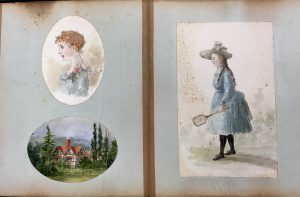 The illustrations likely date to the 1880s, when lawn tennis was just becoming popular in England, and several of the portraits in this album depict Good’s family members in tennis costumes with racquets. 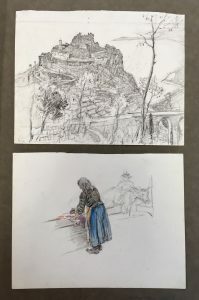 This acquisition also included some loose scrapbook pages with further illustrative work by her brother, Frederick, and their father, Clements. Selection of documents from Sir John Pollock’s Russian Red Cross service. 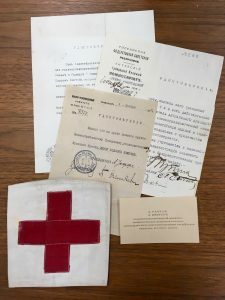 This collection consists of 7 documents and 1 calling card, all printed in Russian, as well as a Red Cross armband, belonging to Sir John Pollock while he served with the Russian Red Cross on a humanitarian mission at the end of the First World War and through the Russian Revolutions. Selection of pages from a travel diary of a trip to Spain, author unknown. 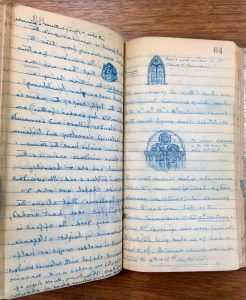 This travel diary describes the author’s visit to Spain in 1896, a time of political unrest related to the Cuban War of Independence and subsequent intervention of the United States. The author provides firsthand observations of this interesting time period as well as describing sites visited in France and Spain. Also included are some hand-drawn maps showing the author’s route and a few small drawings of architectural details. This is only a selection of recently described materials. Search the library’s catalog for more materials (you can limit your search to Special Collections using the toolbar on the right-hand side of the search results). If you are interested in viewing any Special Collections materials, you can schedule an appointment with our staff.